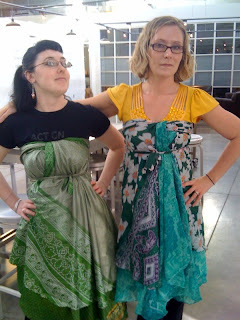 So, it turns out my colleague Laura has the same (or almost the same) wrap-type dress I picked up from eBay in February. 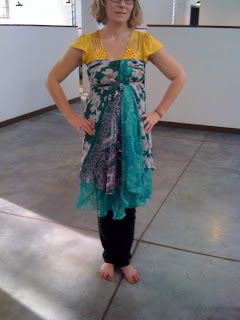 She, too, had little idea how to maneuver this wacky mass of layered fabric. When we discovered this last week, we conspired to try them out together. We thought, "maybe the Kariza magic wrap instructional DVD will show us all we need to know!" 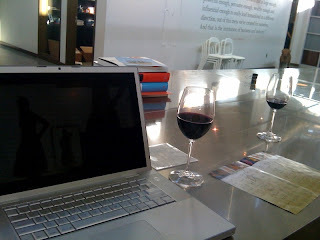 We set up my laptop in an open space, grabbed a glass of wine each and popped in the DVD. Ladies, get your frocks ready. We were in for a show. 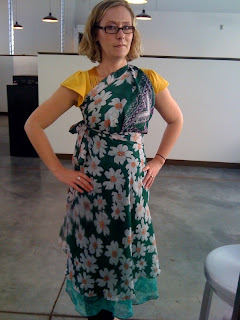 A lovely Indian woman, on 79 individual DVD chapters, demonstrated the potential ways to wear this thing. I also forgot to mention my last trip to the Junior League's Nearly New shop here in Atlanta. I never cease to find some amazing threads (or kicks) at this place. The last trip yielded a pair of navy flat-front chinos from Banana Republic, a pair of black, wool (lined) slacks from The Loft and these fun espadrilles from Montego Bay Club. 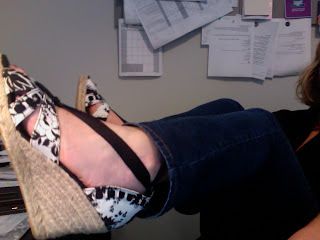 The shoes had never been worn (price tag said $22) and the pants were both like new. Grand total for the trip: $21 plus some change. Go check out the Nearly New shop at Howell Mill and 75 (in the Kroger shopping center). You're sure to leave with some good finds — and help the cause of the Junior League ("Women Transforming Communities"). My younger (and super awesome) brother Paul has been embracing the thrift-store-shopping train. 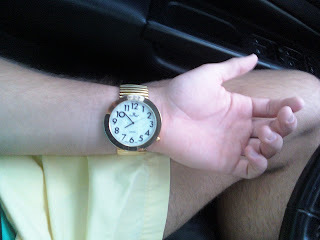 He sent me this fun picture this morning of a watch he picked up at a vintage store in Athens. I can't wait for him to visit the weekend of May 15. We'll do some of our favorite things: cook dinner together (cheese and olive pizza, anyone? ), get our eyebrows threaded at the Indian beauty salon down the street, hit up some thrift stores... and generally act silly. My eBay hat came this week. It was perfect timing, as I haven't been feeling well (read: I haven't wanted to spend much time getting ready for work). 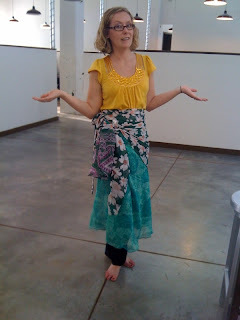 One of my coworkers said I looked Bohemian. 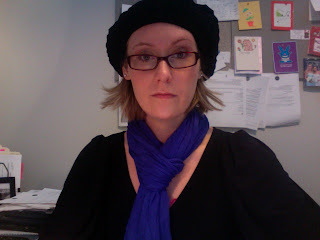 Another said I looked like a Parisian painter. I don't care what I look like as long as my messy hair is covered up. Find more crocheted beanie hats like mine (and tons of other fun, funky and inexpensive hats) through this seller. 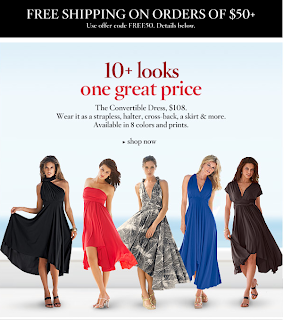 Once you get to NYFashion101's store site, click on "hat." I picked up a boatload of dry cleaning from Roger's Cleaners* on Friday. 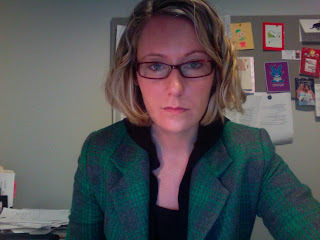 One item was the heather grey/kelly green, plaid, wool blazer I picked up at Goodwill a few weeks ago. From the tag, I would judge it to be GAP circa mid-1990's. 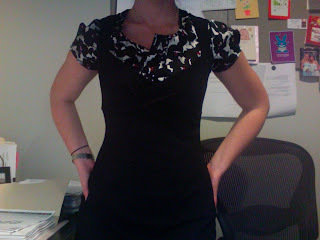 It's a little on the small side in the sleeve length and shoulder width, but I couldn't pass it up for under $4.00. Check out a similar one (blue and grey plaid) on this auction page — size small, $7.00. I'm also wearing another new addition to my wardrobe (if you can consider eyewear to be part of your wardrobe). I had my first adult eye exam on Friday — and viola — I needed some help with my distance vision. I was written a mild prescription and promptly shopped for a pair of spectacles. 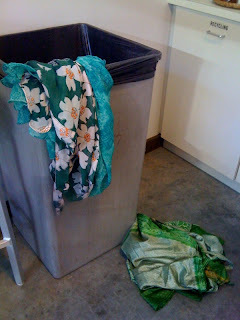 Looking back, I could have found a pair I loved elsewhere (good tip, Julia!) and just had the lenses made. That could have saved me $100 or so. 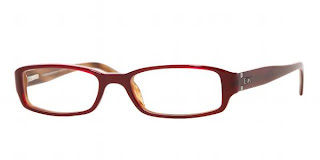 But I loved these fun Donna Karan frames and wanted instant gratification! Silly Katy... It is nice to see street signs sans fuzziness. I'll just keep telling myself that it would have been tough to buy online, like from this eBay seller, without trying on the frames in person. *Note: I need to do a post solely dedicated to Roger's at some point — amazing folks. I dropped off one of my Goodwill finds two Saturdays ago and hadn't had an opportunity to pick it up until this weekend. Upon pickup, I was thrilled to see how great of a job Sunny's Alterations and Shoe Repair did with the piece. 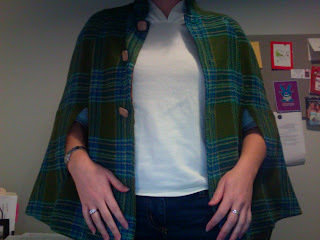 When I found (okay, scratch that — when Mb found) this green, plaid, wool, lined cape with lucite buttons a few weeks ago on our thrift store shopping spree, I knew I had to have it but realized the seams were coming undone. Not surprising, it's probably from the 60's or 70's. Sunny's did a fabulous job cleaning up the lines and bringing this thing back to life. For $4.39 plus $10 at the alterations shop, I'm one happy cape owner. Here's one from Victoria's Secret. 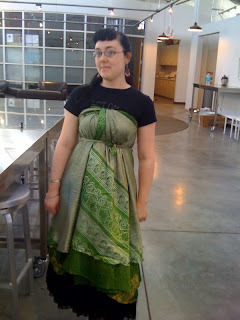 Note to self: get my damn eBay dress figured out ASAP. What am I waiting on now that I have the DVD? Oh yeah, I hate being confused and frustrated so I've been putting it off. Okay, so I didn't live up to my Goodwill Jackpot blog post from two weeks ago. I need to get several of the items dry cleaned before I wear them — and I'd like to get one piece back from the alterations shop before I make the one big dry cleaning run. The vintage wool, plaid shrug with green lining will look so much sharper once the seams are cleaned up. 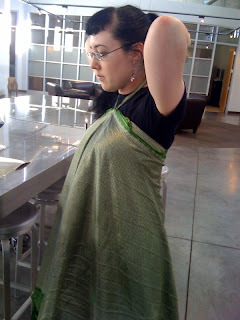 Can't wait to wear that one — though I better do it quick because it will be too warm for the piece soon. But I did get a chance to launder the little black dress from Old Navy ($3.00) that I picked up during that Goodwill visit. The dress has a relatively classic cut and is made from that lightweight lycra blend material that wears well for years. Today I paired it with a Target top I found on clearance back in November. For feeling a little under the weather this morning (sore throat, headache), this was an easy and quick (read: no-iron) outfit to put on.